At the turn of the last century photography was beginning to find its place in every day life. It was the heyday of Kodak and the emergence of the amateur photographer. This time also saw the beginnings of the modern movie industry. By 1900 there were those who saw the future in films. In 1913 Cecil B. DeMille made the first of his 70 feature films. In 1914 Sam Goldwyn released his first feature length film. And in 1918 Louis B. Mayer moved his family to Hollywood. The industry was creating itself. 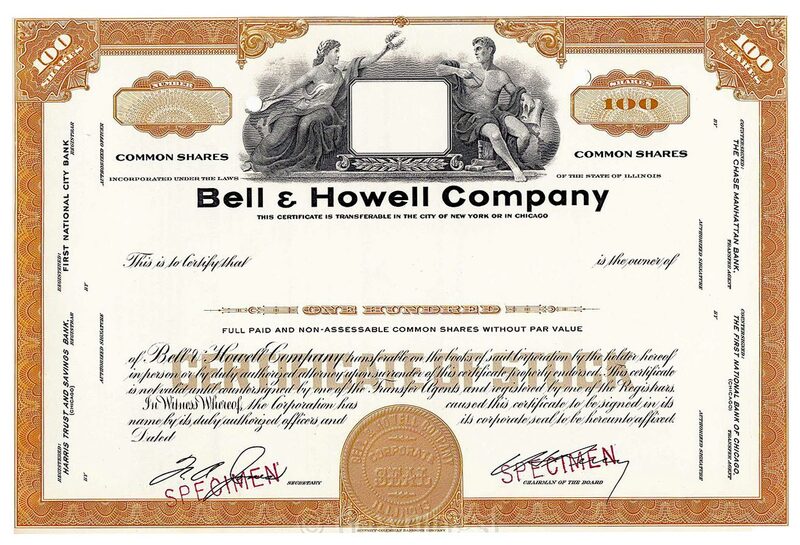 This is a stock certificate (a sample one and not an actual issued share certificate) for the Bell & Howell company. creating and selling equipment to this new and growing business. On February 17th, 1907 they incorporated the “Bell & Howell Company” to manufacture motion picture projectors.Their venture paid off and they slowly branched into other devices and equipment for their industry. And in 1934 they introduced the first light weight amateur motion picture camera which used a cassette of film that could be loaded in daylight. 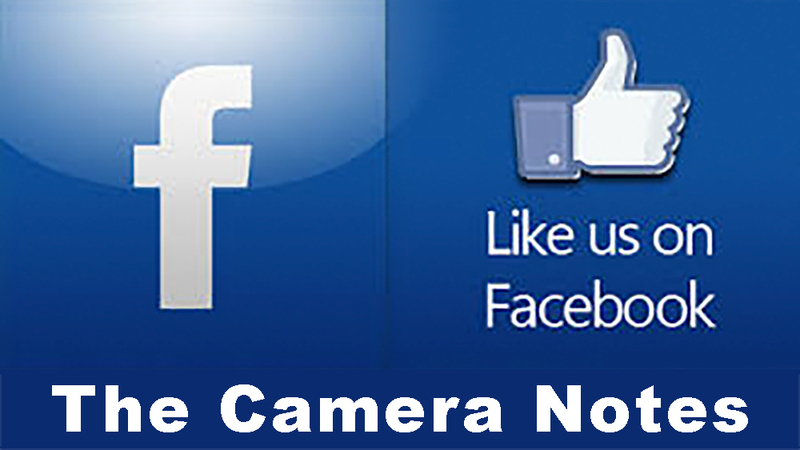 This move established them as manufacturers and vendors of amateur photographic equipment. What they did not make themselves they licensed from other manufacturers to create a full line of photographic equipment. But what has this to do with Canon? By 1950 Canon had established itself as a maker of affordable quality cameras in the home Japanese market. But they had also had considerable success with sales to American servicemen stationed in Japan. And with this encouragement then company president Mitarai made a trip to the United States in August of 1950 to attend a trade fair and study trends in the camera market. This is an ad for the F-1 camera. 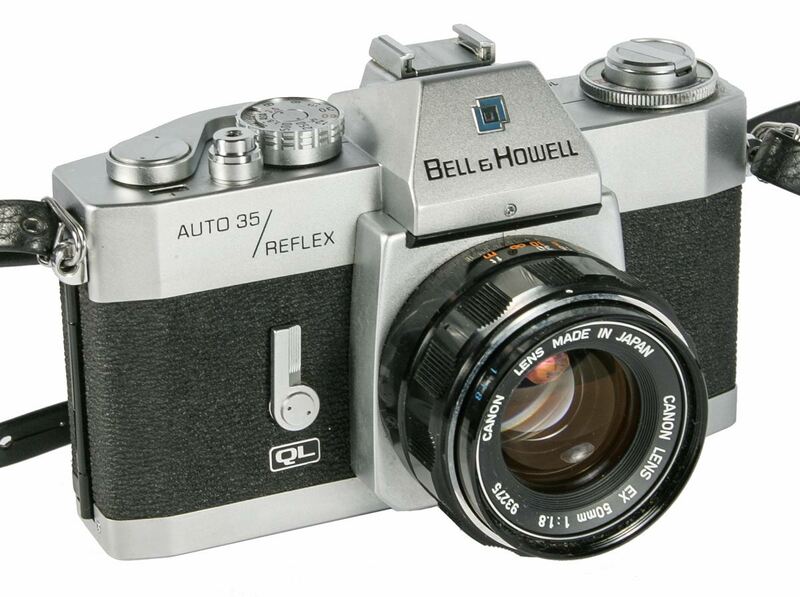 Although this was a Canon flagship the advertisement still has in the lower right the Bell & Howell name although that name does not appear on the cameras. But Canon needed the reputation for quality and service that B&H could give them. The Canon Online Museum tells us that he was also looking for an opportunity to break into the American home market. In those days, before modern jet travel, Japan was a long way away. Japanese equipment was viewed with suspicion and getting it serviced was seen as a problem by the consumer. Canon was looking for a partner. On his trip President Mitarai visited Bell & Howell to seek their assistance in entering the American market. Bell and Howell said they were not interested and used as an excuse that the Canon factories were in wooden buildings which they felt were subject to fire. This meant that supply could be interrupted unexpectedly putting at risk the investment in promoting the cameras. Personally, I also think, that so close to the war, that racism played a part in that decision. But that is just my take on it. I am not certain if it was on the same trip or as a result of the rejection of Bell and Howell, but in 1950 Canon entered into an agreement the C.R. Skinner Company in San Francisco to import cameras into the United States. These cameras had an engraved baseplate which said “Made in Occupied Japan / Serviced and Guaranted in San Francisco California”. To have this on their cameras must have been galling to the Japanese who are a very proud people. Canon was determined to become established in the American market and in 1955 opened offices in New York city. But they still needed a big name American company behind them to get market acceptance of their cameras. And then in 1961 they finally came to an agreement with Bell and Howell which resulted in a relationship that lasted through to 1976. At the time of the agreement the Canon 7 was in production and the Canonflex RM was just a few months away. Three forms of branding were apparent. 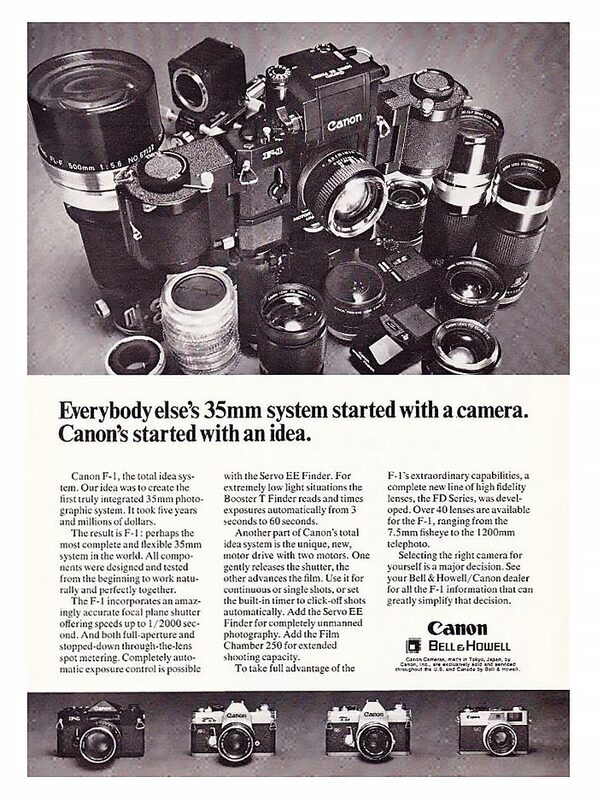 As in the ad on the left, Canon cameras were simply promoted by Bell & Howell. They advertised and sold Canon Cameras. However, more than that, many cameras came out carrying both company names. In this advertisement the names of both companies appears in the ad and on the camera giving the American consumer the comfort of knowing a large well known American company stood behind the cameras. 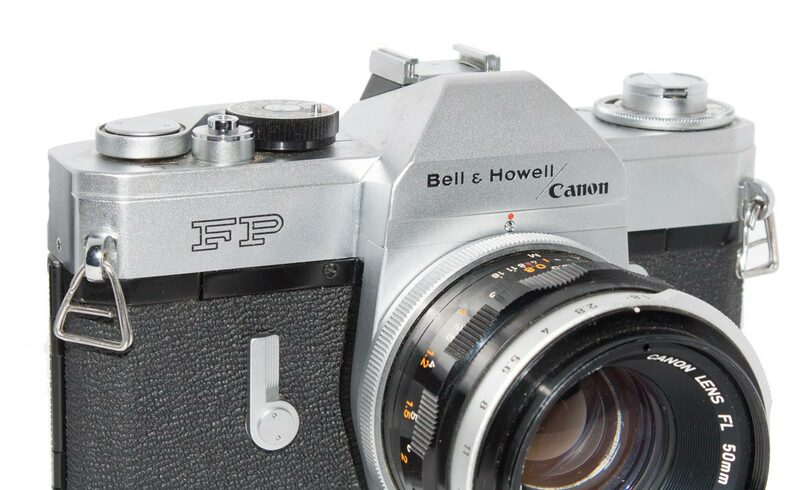 Both company names appear on this Canonflex RM which was introduced in April of 1962 shortly after the Canon/Bell&Howell agreement was entered into. In all respects it is identical to the Canon branded model except for the names. These B&H branded models are easy to find for the most part and don’t appear to command higher prices. Another example of the dual name was on the Canon FP. There was a Canon only version and a dual name version. There were others that had the same variations. The Canon FX was one but I don’t have a dual name copy although I have seen them on the web and on e-bay in particular. For our purposes here I am sticking to cameras that I currently have in the collection. 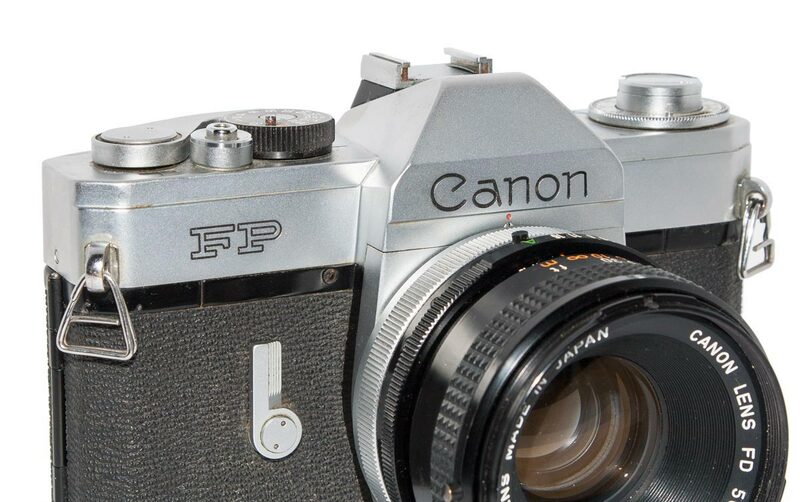 This Canon FP was produced as a Canon camera but for importation into the United States it displayed both company names. 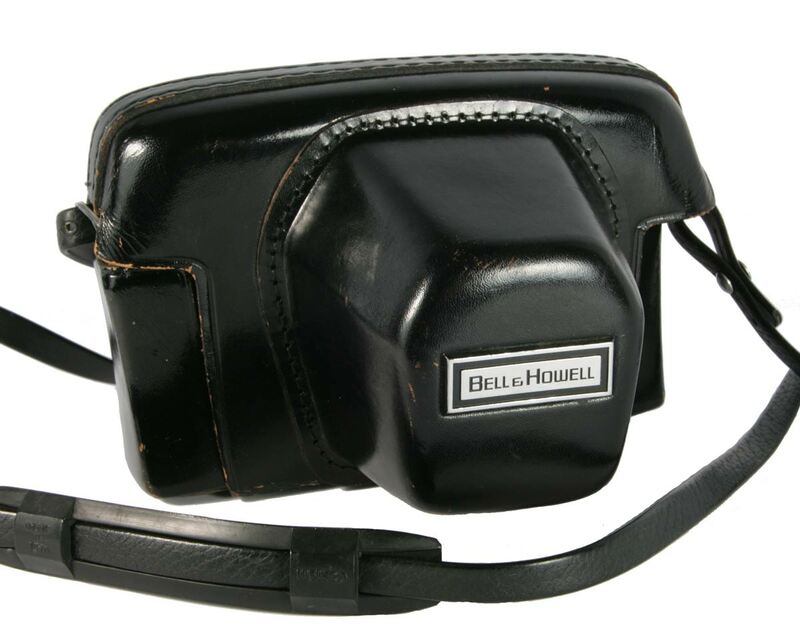 I don’t know if all Canon cameras that came into the United States through Bell & Howell had to have Bell & Howell’s name on them in addition to Canon’s. But some certainly did. And finally, Bell & Howell put their name alone on some Canon cameras. Usually the lens bore the Canon name but there were bodies that were B&H alone. An example of this is the Canon EX. 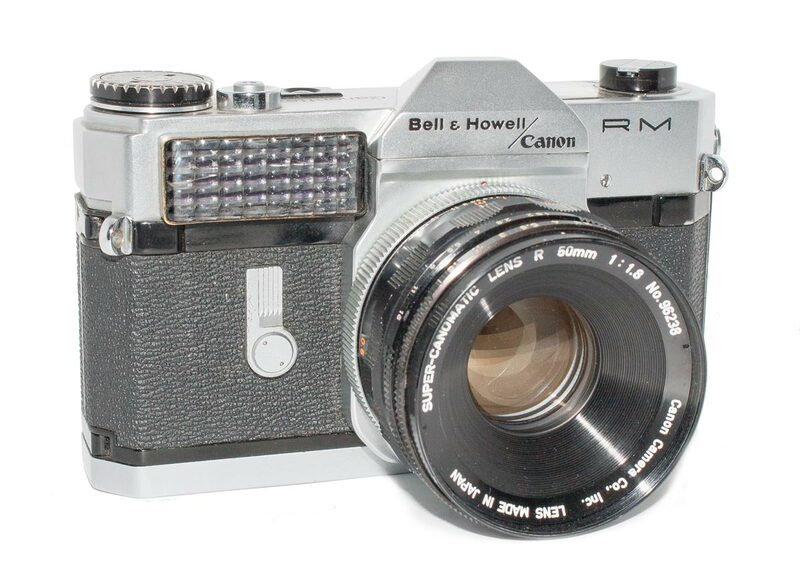 This camera came out under the Canon name and also was sold as a Bell & Howell camera. They were identical cameras and the lenses all said “Canon”. The Canon EX was produced also as the Auto Reflex 35 under the Bell & Howell banner. This camera was not released with dual names and on both versions the lenses are the same and bear only the Canon name. The case was branded as B&H as well. 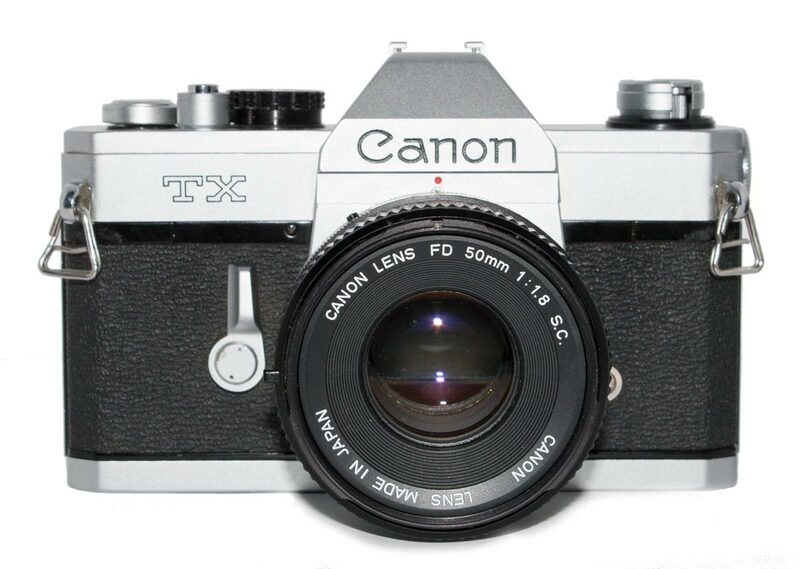 The Canon TX came out in March of 1975. 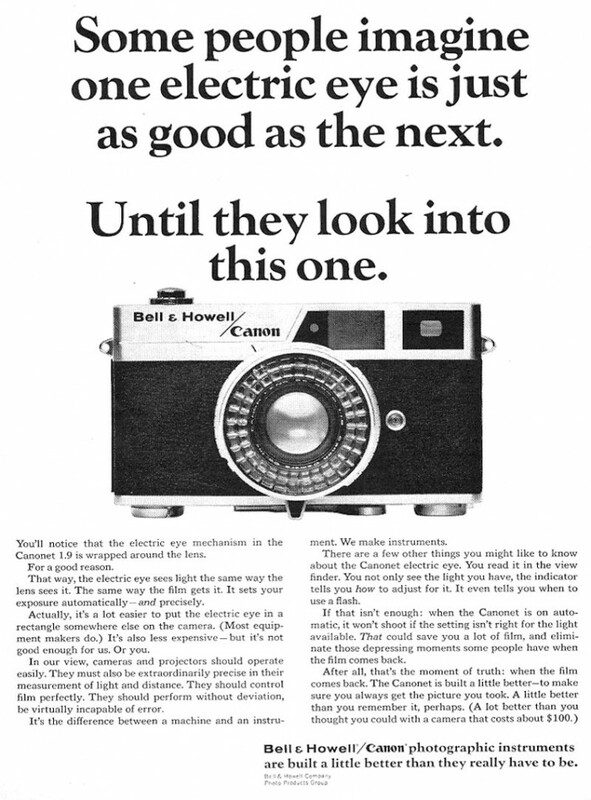 Several months earlier Canon had created a camera for Bell & Howell to market under their own brand. This was the FD35. According to Dechert this camera was really an updated TLb which itself was a stripped down version of the FTb. Both had a top shutter speed of 1/500th, no self timer, they did not support the Canon Auto-tuning flash system and they had a simpler center weighted average metering system. The major improvement in the FD35 over the TLb was the addition of a hotshoe. 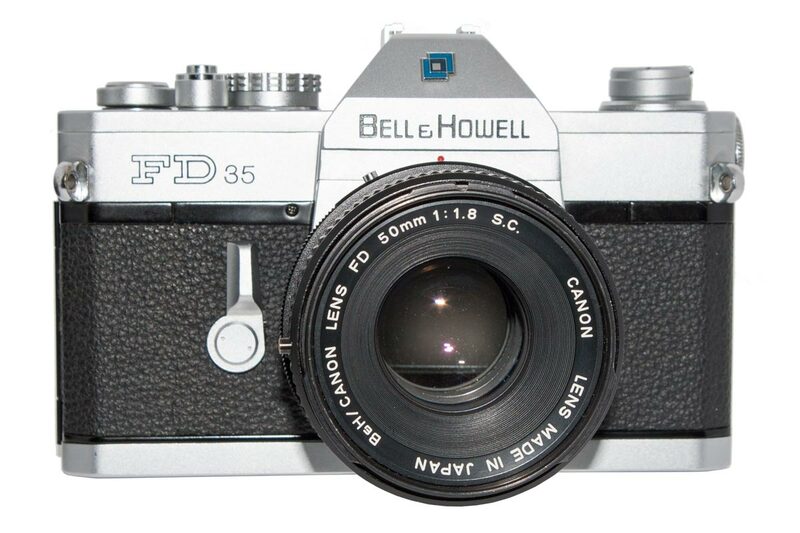 The FD35 was a Canon model created for Bell & Howell to market. Even the lens on this camera is B&H branded. This camera was never released with both Canon and Bll & Howell names on it.. It was after the release of the FD35 that Canon also sold this camera calling it the TX. The FD35 was introduced first and later Canon came out with the TX which was essentially the same camera. It appears that Canon supplied the FD35 to B&H long after their marketing agreement had run out. In the photo above and to the left examine the name ring on the lens. 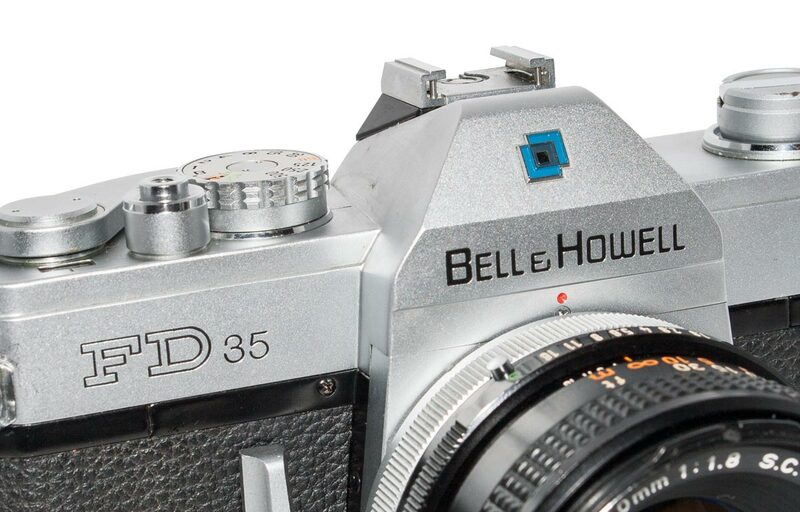 This is the only example I have seen of one of the lenses on a Bell & Howel version having any Bell and Howell branding whatsoever. Here you can read “B&H/Canon Lens”. All other cameras I have seen with the B&H brand had strictly Canon lenses. 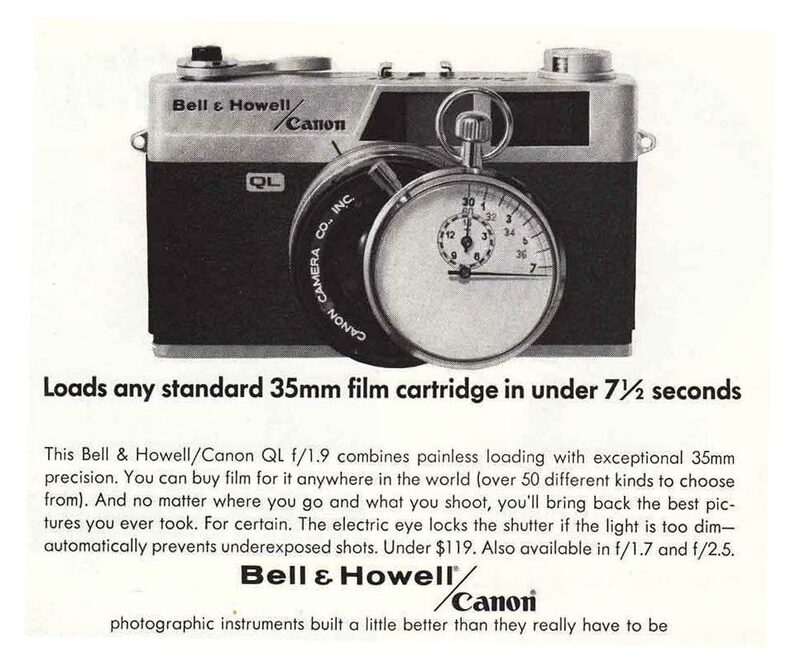 And that is what I have been able to learn about Bell & Howell’s connection to Canon. I still have many questions. For instance, did any of the Auto 35’s or FD35’s come out in a black version? Or were there any other lenses bearing B&H markings? But that’s what makes a hobby so much fun. So much to learn and so little time to do it in!